Jimmy had been burned when he was very young. Now he slept rough, on a mat in the corner of the town marketplace. His painful infections were so serious he would die without intervention. Jimmy was homeless, and his severe wounds from childhood burns had never been properly treated. He was suffering terribly as toxins built in his body. 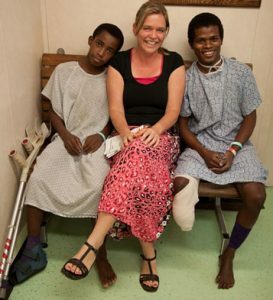 Kiwi nurse Vivien first met Jimmy when she accompanied his surgeon on plastic surgery rounds soon after he was admitted to the Mercy Ship. For Jimmy, the removal of his leg was also the end of years of pain resulting from his childhood injury. ‘I loved his positivity,’ Vivien reflected. ‘Even after all he had been through, and not experiencing much love in his life at all, he radiated love in such a huge way. There were so many hugs, so much laughter and so much talking over the months that he was there.